​Historic preservation endows our community with a shared remembrance of the past. Old buildings physically mark a space, place and time. And we, as a community, not only observe historic buildings and monuments, we also interact with them. We will give thought to the terms on which we engage with historic spaces. In our first panel, we will look at the tension between historic preservation and the use of cultural and environmental resources. In our second panel, we will consider how preserving historically significant buildings affects housing access and availability. Professor Peter Byrne’s concluding keynote will provide contextualizing commentary. This panel will address the intersection of cultural preservation and environmental issues like climate change and energy development. Our panelists will explore how these issues are addressed both domestically and internationally. This panel will be a discussion about balancing development and housing access/availability with the preservation of historically significant buildings and areas. Federal regulation has long been seen as vital for the protection of the environment. Accordingly, much of the policy debate about environmentalism focuses on the role the EPA and other federal agencies play in codifying national protections. However, the new administration has signaled through rhetoric and action that it will move towards deregulation of federal environmental protections. The administration's second executive order directed review and approval of the Dakota Access and Keystone XL Pipelines. Two months later, a March 28th executive order emphasized deregulation of energy development on federal lands. Later, in June, the administration publicly announced its intent to withdraw from the Paris Agreement. In response to these policies, other groups have pledged to uphold environmental protections in the absence of federal oversight. Attempts to deregulate the energy sector are being met with legal challenges by non-profit groups and are being opposed by some state and local governments. Additionally, twenty-three states, including Virginia, have committed to fulfill the aspirations of the Paris Agreement. Our symposium will look at these issues as they apply closer to home. The Chesapeake Bay and Offshore Energy Development panels will explore past and current examples of state and local cooperation on regional environmental issues. While federal agencies have played a key role, we examine the possibly of lessened federal involvement brought by this new political climate. In doing so we hope this discussion will provide insight into broader issues of federalism and environmental regulation. 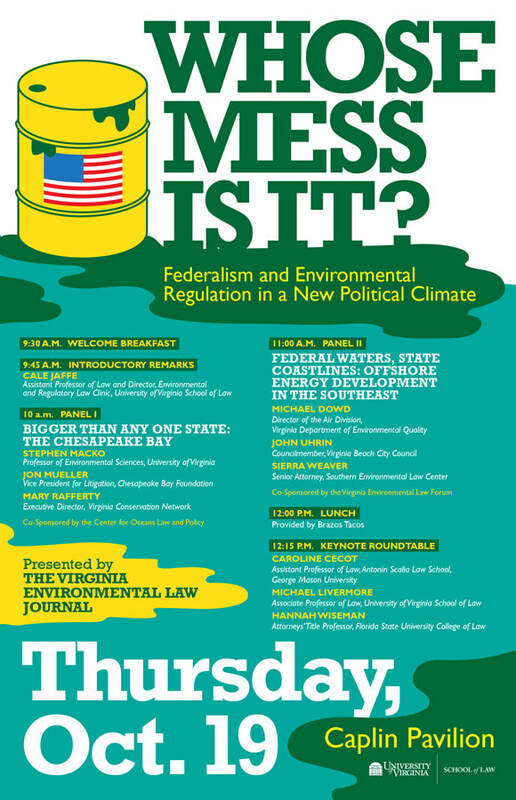 The Virginia Environmental Law Journal delved into current issues in environmental crimes, enforcement, and corporate compliance at its annual symposium on Oct. 28th, 2016 at the University of Virginia School of Law. The symposium, "Environmental Crime: Current Issues in Corporate Compliance," brought together members of legal academia, nonprofits, government and private practice, with panels focusing on environmental crimes through the lens of recent enforcement actions against Duke Energy and Volkswagen. The Virginia Environmental Law Journal thanks all of our esteemed participants for helping us explore this salient topic in environmental law. Transcripts from the 2016 symposium will be published in 2017 as part of a forthcoming digital issue.